the other day i received the most awesome pair of shoes from the fantastic danielle of solestruck.com.. after perusing the site and seeing tons of fantastic shoes i saw these and thought i had to have them.. and once i opened the box and put them on.. i didn't want to take them off.. ever. instant love. i found them to be surprisingly comfortable for 4 inch platforms.. and very versitile! i'm certain they'll be in many posts to come! thanks solestruck!! - fashion blogs of course!! you guys are all so fantastic! - anime and korean dramas... seriously... i love to cosplay... does that make me extra geeky? - home decor/craft shows.. i absolutely love going to craft shows.. and buying things for the house.. especially seasonal items.. but most of all christmas.. i love the holiday season! i could literally listen to christmas music year round. - 2 years ago i could barely run a mile.. and this past january i ran my first 1/2 marathon and am doing it again next january.. i guess i enjoy the pain. - Like ooh pretty I sound young, and also look young.. as you can tell.. my coworkers always make fun of me for being child labor... it's quite sad. but i know one day i'll appreciate it. It's great to buy something online and they fit perfectly isn't it? Good for you. They look great on you too. Im gushing over your NYC photos!! They are lovely!!!!!!! these shoes look so wonderful especially on your outfit! andrew told me about these shoes....and tried to tempt me into making my own fashion blog. i don't think i have the dedication/patience that you have to keep up with one though! the shoes are super cut though...anything w/ heels 4in+ are good in my book. comfort+great style...life is really good! Hope to hear fm you again dear...Looking good there as usual! great shoes. I always love the pics you take by that gorgeous bed. Loved hearing more about you!Most surprised by the music- that is really cool! you run 1/2 marathons? bravo. i'm where you were two years ago, so you've given me hope! you are so beautiful !!! It's good to know I'm not the only one out there with a young sounding voice. I swear I get bad customer service on the phone sometimes because they think they're speaking with a teenager! And looking young is always a good thing! the outfit is so clean but so chic.I love every single piece. Those shoes are so totally cute. I'm really impressed with your cupcake making skills, they look simply perfect. So feminine, I love the blouse!! I wish people would give me free shoes! so in love with your top! can i just say how much i love your bed frame! and i play the viola and piano, too. I'm in love with those shoes. You look great, and it's so nice to know more about you. I gave you the “I ♥ your blog” award. Very cute shoes. I like your top too. Killer shoes....and what a win that they're comfortable too! ahh you tagged me! thanks so much dear. i can't wait to do this !! will get onto it first thing tomorrow after work. thanks thanks! and i think you do basic much better than me ! i love that look your rocking. those jeans look like they fit like a dream and such a great color! You look so classy here. Love that top and those shoes. I think its the best thing that you like to bake and decorate! How sweet. I love it too. Is that in the hotel? What a great bed! And love your outfit!I find platforms are always more comfortable than "normal" heels. LOL sometimes it takes a 1000 tries for me to find the right outfit to wear for school. Wow, you'll participate in a marathon? I admire you. I'd be dead after hlaf a kilometre. And anime and Korean dramas are cool! You play the viola??? ME TOO! Those cupcakes... did you make them? They look d.e.l.i.c.i.o.u.s.! running uh.... gal pal is trying to get me to run too but a mile or 2 for me is perfectly fine. You look lovely in the outfit images,the top is adorable! 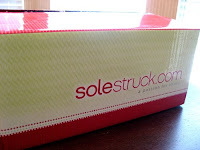 The Solestruck shoes are fab too. Free fab shoes + cupcakes = Love! Very cute shoes! Random I know but I love your bed ;) Good luck with marathon training- sounds very intense! Ah salivating ontop of your keypads is a bad thing but hard to not when you're faced with such a scrumptious assortment of cupcakes. Yummy -- the shoes and the cupcakes! They do look just perfect. It's crazy how super tall heels can be super comfortable sometimes. It's your bedroom? Great bedroom you have!! I love your top. And your musical talent is amazing.. three instruments! That's awesome! Indeed - full loving with the shoes - you look great as always! the cupcakes - i'm dreaming of them! Go strings! I play the cello! But I also want to learn how to play the piano and guitar. I love your shoes! those shoes are lovely! and they do look comfortable. Sweetie, you look so cute in this outfit! And I desperately need to find a good pair of black skinnies too. and btw, everything in your guiltiest pleasures are same as mine. hehe. just wanna share. You look great! Love everything about the outfit! Love that look! Mmm and more cupcakes!!! I want one of those cupcakes.